What happens when a board of volunteers comes together to host a conservation education event? AMAZINGNESS! Again, I was lucky to be a part of another successful event - I got to work and meet a lot of great people, and to boot a chance to learn from the experience. There's power in numbers and nothing can stop a determined group of people who care about the environment. I'm already looking forward to 2018! 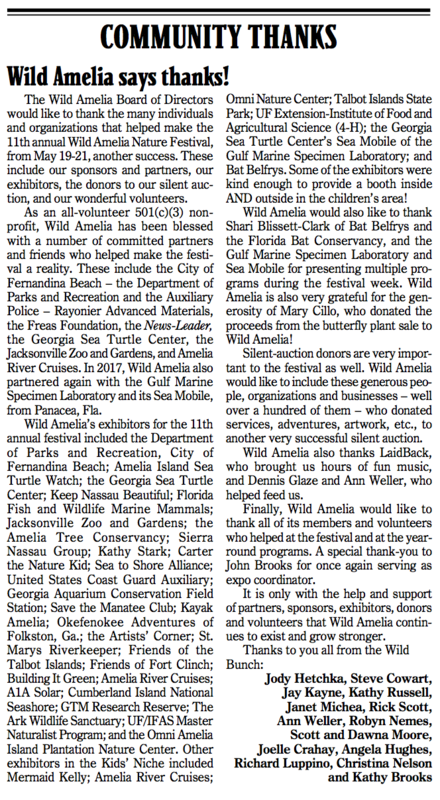 *Note: Below is a clipping from the 5/31/17 Fernandina Beach News-Leader, it's from the Wild Amelia board to the community and festival partners. Saturday, April 22nd - Earth Day Event Success! 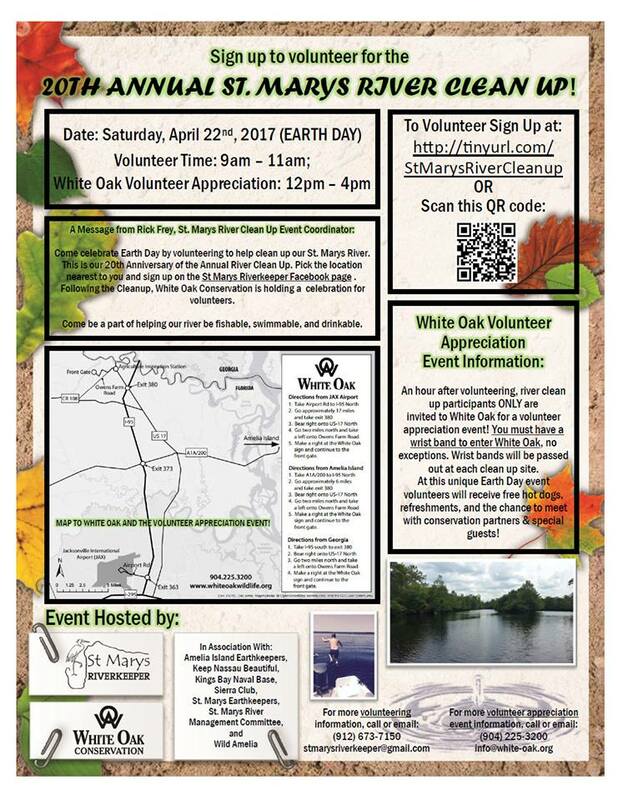 Following the clean-up volunteers were invited to a one-of-kind appreciation luncheon at White Oak Wildlife Conservation facilities. At this portion of the event I was afforded the chance to represent Wild Amelia's conservation education efforts. I had the chance to connect with local community members and future potential volunteers. ​Overall, it's amazing what people can accomplish when they come together! It still seems a little surreal that I had the chance to intern with the City of Fernandina Beach. I thought of local governments as closed-off entities in away - only available to the well informed citizens and residents who are active in local issues. I was completely wrong. In March of 2016 I emailed the recently hired City Manager, Dale Martin. I asked if an internship with the City was available. He sent an immediate and friendly reply that basically said, of course - let's set a meeting date. In May 2016 I officially started my internship with the City. Dale and Nicole (Dale's Assistant) were above all kind and dutiful public administrators. Their guidance and lessons were invaluable. It's exciting that I got to help out with such an important document. Above all I'm happy that I had this opportunity, I can now carry this experience with me into a future career. I'm thankful to be a part of the Wild Amelia Nature Festival this year! To learn about this event click here. You can also visit wildamelia.org to learn about their non-profit conservation education efforts. 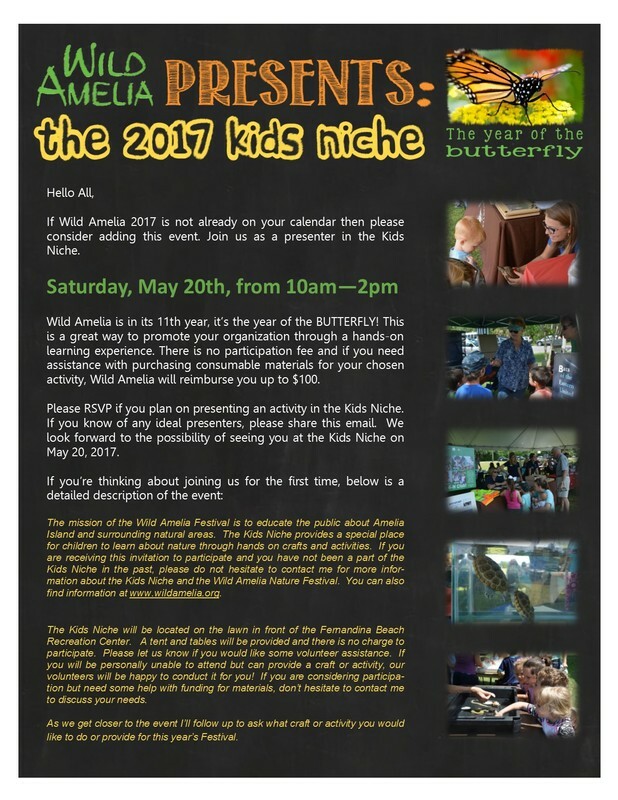 There are sub-parts to the Wild Amelia Nature Festival and I'll be coordinating the Kids Niche portion. I created and sent out the below flyer to possible event presenters. I can't wait to see who all signs up! 2016 - Where Did You Go? ​"2016 went by so fast..." I'm like a broken record because I find myself saying this a lot lately. Work is great, school keeps me busy, and the internships have provided me with experiences I would have otherwise went without. I've enjoyed this year! Even though there have been times of stress with deadlines and often feeling behind - I wouldn't trade this year for anything. As I'm writing this blog I'm trying to recap on the most memorable lessons I've gained this year. With the City of Fernandina Beach I got a "backstage view" of how local government works. I met some wonderful people and must say - they have the whole local public administration thing down to a tee. 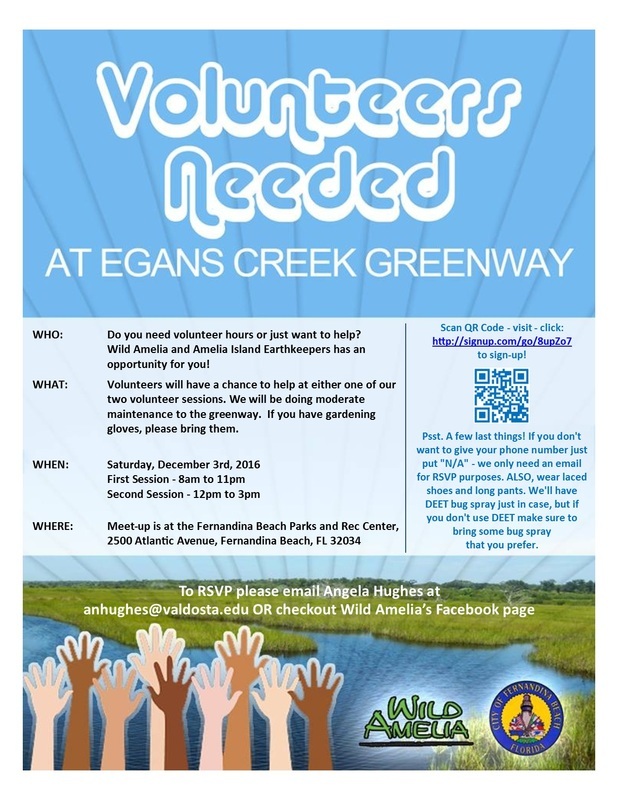 I've also been afforded the opportunity to intern with a local conservation non-profit, Wild Amelia - it's amazing what this non-profit has accomplished without having a physical location. Literally Wild Amelia operates off monthly meetings and communication alone - it's commendable! I'm not completely sure it's possible to recap on grad lessons - most of the lessons learned came from research papers or PowerPoints. I've posted all of my major work to this site - it helps me keep track. But there is one broad lesson that I feel deserves attention. Government in the U.S. has a bad wrap. Often when I talk to people about school they immediately respond with a, “ugh…” or start to get a glazed-over glare. After this year I see the struggles of local, state, and federal governments and wish I could convince everyone I know and meet that public administration is honorable and at times, tough work. Even though everything is copacetic in my bubble of a world - I’m looking forward to an end-of-the-year break. Thanksgiving and Christmas can’t get here soon enough. It’ll be a nice rest before my last year of grad school starts and before finishing my internship hours with Wild Amelia. Who knows what 2017 will bring. Until then I'm going to enjoy the break, craft a little here and there, and sleep in every morning! About a month ago I received my acceptance letter from Valdosta State University (VSU)! I applied to VSU's master program in Public Administration. The MPA program is accredited by the National Association of Schools of Public Affairs (NASPAA) and will complement my undergrad studies in supervision and management. My first classes begin January of 2016 and I can't be more excited to be a Blazer in the upcoming year! Once I'm a post-graduate from the Valdosta State University MPA program I foresee myself working in higher education administration. In my future position I aspire to help develop any college or university policies that promote student, community, and economic growth. Since 2006 I've worked in the public sector with Florida State College at Jacksonville (FSCJ) and College of Coastal Georgia (CCGA). As a past librarian assistant and current information specialist I've witnessed the ebb and flow of two different colleges. I consider both institutions as a second home as I've grown in my education and career. During my employment with FSCJ I was an active member in the Association of Florida Colleges (AFC is a self-funded association lobbying for Florida's higher education). As an AFC FSCJ Campus Representative and FSCJ Chapter Historian I got first-hand experience with implementation of education by-laws, policies, and state legislation. To contribute to any institution's growth I need to know the fundamentals such as provided by the core concentration of the M.P.A. program. The building blocks of this program will open a two-way street between me and the inner workings of the public sector. Combining my experiences with this program will create a springboard for me to rise to academia challenges and to contribute where needed. Over the years as a full-time state employee and a part-time student I've learned that eduction has the immeasurable power to promote growth and stability; overall I want to be a part of a better tomorrow and that tomorrow includes an educated society. 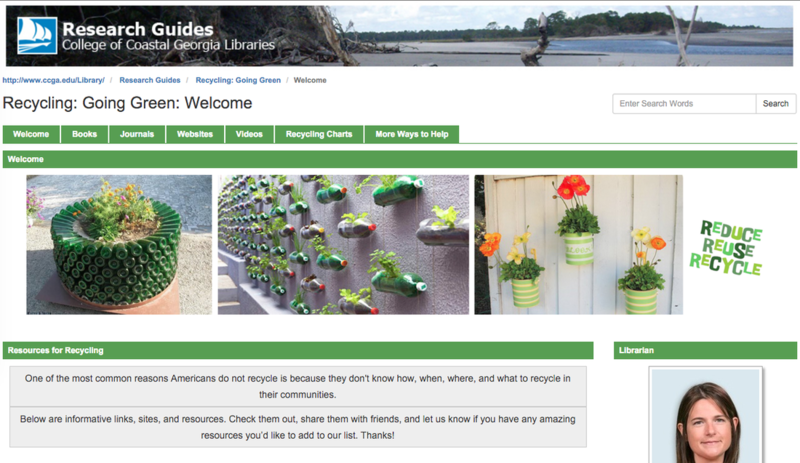 Recent Project: Recycling Research LibGuide & More! "One of the most common reasons Americans do not recycle is because they don't know how, when, where, and what to recycle in their communities. 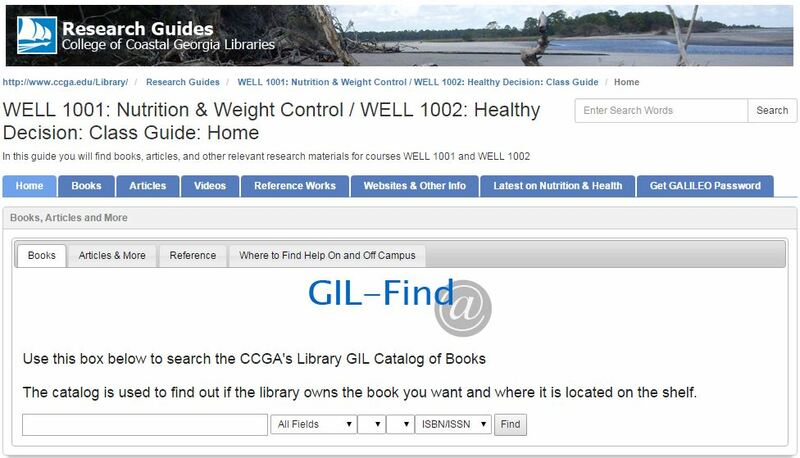 Below are informative links, sites, and resources. Check them out, share them with friends, and let us know if you have any amazing resources you’d like to add to our list. Thanks!"